Today, we all together in Armenia, Artsakh and in Spyurk are celebrating the 100th anniversary of the First Armenian Republic and the Heroic Battles of May. Our people, who had seen genocide, stood at the verge of life and death, through enormous efforts reinstated independent Armenian statehood and announced the birth of the First Armenian Republic. 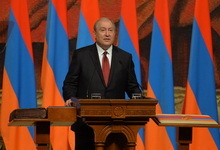 Although it was short-lived and witnessed many hardships, in the subsequent decades based on the first republic developed were the Armenian economy, education, science and culture, a well-educated and cultured society had been formed which in 1991 declared new independence and new victories. Today we have to comprehend profoundly the significance of the Armenian statehood. As a result of the recent changes in Armenia, we have got the opportunity for a leap forward for which there are adequate human and institutional resources. We have to pull these resources together, have to act more efficiently and flexibly as critical times create opportunities for soaring. Hence, let’s start creating together the Armenia of tomorrow, appreciating and beautifying the Armenia we have today. I cordially congratulate us all on the occasion of Republic Day, 100th anniversary of the First Republic and the Heroic Battles of May. I wish you all peace, prosperity, and optimism. Long live the Republic of Armenia and Republic of Artsakh! Long live citizens of Armenia!